The International Review of Couple and Family Psychoanalysis recently celebrated its tenth anniversary. 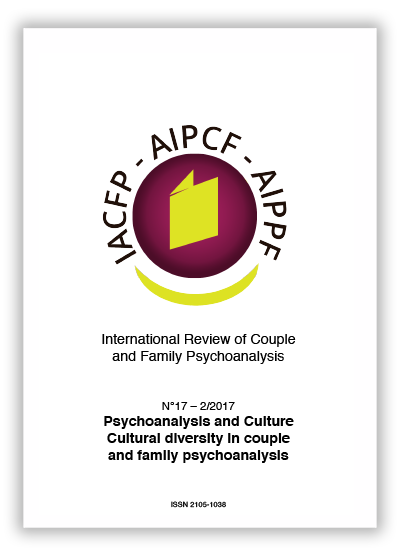 The Review began as part of the vision of Anna Maria Nicoló, its first Director, who felt it was essential to create an editorial space in which the members of International Association of Couples and Family Psychoanalysis (IACFP) could express their theoretical ideas and share their clinical experiences with colleagues around the world. The Review was established following the first IACFP conference in Montreal in 2007. Like other international psychoanalytic journals, the Review was established to include the work of psychoanalysts from around the world, writing in different languages. Its difference as a journal perhaps lies in the fact that it seeks to represents a range of different models, views, debates and theories about couples and family psychoanalysis. This plurality of theoretical ideas and associated rich debate have been characteristics of the Review since its inception. The principal interest of the Review has been to maintain a high level of scientific and theoretical authorship. This aim has been made possible with the support of an Editorial Committee and collaborators from a range of countries with different theoretical orientations. This work is further supported by a Peer Review Committee, comprising colleagues who also represent a broad range of nationalities, languages and theories. Psychoanalytic studies focused on the family and the couple have been steadily developing in the last decade or so in various countries of the world, mainly in Great Britain, Argentina, France, Italy and the United States. This has produced a substantial range of theoretical contributions which, through the Review, are now accessible in many areas of America, Europe, Africa and Asia. It is the intention of the Review to represent these viewpoints in a manner which allows for a constructive debate about these varying models which can facilitate a transformation of ideas in the field of couple and family psychoanalysis. It has been and will be our further intention to maintain a focus on establishing common ground amongst psychoanalytically oriented couple and family psychoanalysts. The overarching goal is to continue to encourage research into explanatory models that allow for an understanding of meaningful relationships between individuals by paying attention to both the manifest and latent levels of these relationships. The Review is particularly interested in promoting a deeper understanding of the unconscious determinants of the links, collusions and alliances that we observe clinically as well as understanding the intersubjective aspects of couple relationships. This is the focus that the Review hopes to promote through its sustained publication of clinically- and theoretically-oriented articles on couples and family psychoanalysis. In this way and over time, the hope is that this will enable the links, collusions, unconscious complementarity, and unconscious alliances, that we observe in couples, to become articulated with greater clarity. It is my aim, therefore, to carry on the project as articulated from the Journal’s inception and advanced by subsequent directors of the Journal, Ezequiel Jaroslavsky and David Benhaim, who conducted the Journal from 2011 until the last issue. I am grateful to all those directors who preceded me for the direction they have given the Review and for all their hard work that allowed for the publication of 15 issues which contained debates of great interest, along with new, original and engaging themes. In my role as Director of the Review I want to build on the work and commitment of my predecessors and to continue the spirit that has been established and which has sustained the Journal thus far. As such, I wish to encourage the interchange of ideas, experiences and investigations and facilitate constructive debates in order to develop a greater theoretical and clinically useful understanding. In doing this I think that an important function of the Review is to be able to represent the exchange of different cultural perspectives. Supporting these aims, the Review will be now accessible on the new and easily navigable website of our Association. The publication of the Review will be twice annually in July and December. In terms of the supporting committees of the Review, there are eight members in the Editorial Committee: Henri-Pierre Bass, Rossella Del Guerra, Raffaele Fischetti, Irma Morosini, David Leo Levisky, Ezequiel Jaroslavsky, Timothy Keogh and Manuela Porto, with Massimiliano Sommantico as Editor in Chief. This Committee is assisted by our Editorial Drafting Secretary, Francesca Enuncio, who has provided valuable services to the Journal form its beginning. There is a Reading Committee with members of three linguistic areas for the “double blind” readings. a section devoted to the integration of clinical practice and theoretical ideas. The Review will also offer a space on the new IACFP website for the readers to engage in dialogue and debate. In conclusion, I would like to thank all of those involved with this project, to the Scientific Committee, to all the colleagues of the Association, the colleagues of the Drafting Committee and the Administrative Council, who have always supported the project. When Anna Maria Nicoló submitted her resignation to the Journal she wrote «I wish you and us for this to be the equivalent of the Greek word “agora”, a place of interchanges and democratic enrichment, a central place of the “polis” that has marked the history of the ideas». My wish is to be able, at least partly, to continue taking forward this aspiration.